Weighty Matters: Big Milk's dietitians recommend French fries, hot dogs and milk shakes! 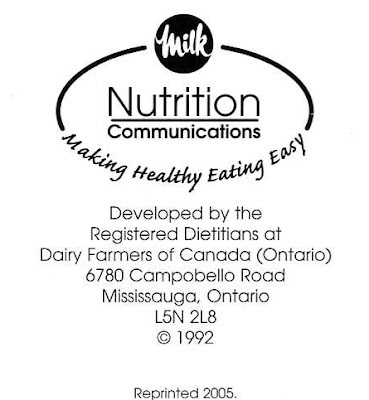 Big Milk's dietitians recommend French fries, hot dogs and milk shakes! My wife and I were cleaning the house this past weekend in preparation of showing our house. She came across this handy fridge magnet that was given to her at the hospital following the birth of our now 2 month old daughter. It's entitled, "How to Build a Better Baby". 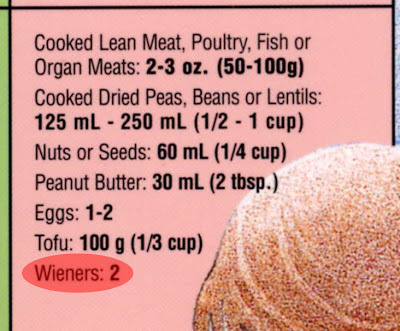 It is meant to guide pregnant and breast feeding women to healthier choices in order to "build better babies". "Your diet is essential to you and your baby. Until birth and during breast feeding your baby depends on you to supply everything needed for growth and development. What you eat during pregnancy and during breast feeding will help you be healthy and give your baby a healthy start in life"
Want to know what the registered dietitians of the Dairy Farmers of Canada feel women should eat in order to make "better" babies and help mom "be healthy" and give baby, "a healthy start in life"? 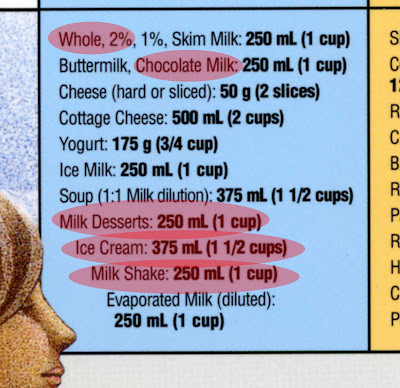 Apparently whole milk, chocolate milk, ice cream, milk desserts, milkshakes, hot dogs and french fries. Take a look at these enlargements. 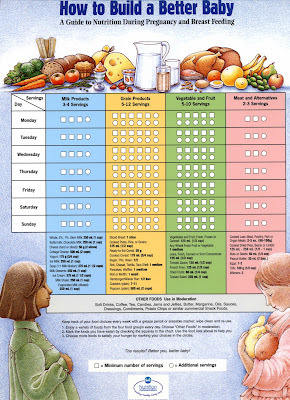 They're from the bottom of the chart and they summarize the registered dietitians of the Dairy Farmers of Canada's guidance and examples as to what constitute "healthy" milk, meat and vegetable choices and servings. When I showed this to our dietitian at BMI, she sighed sadly. 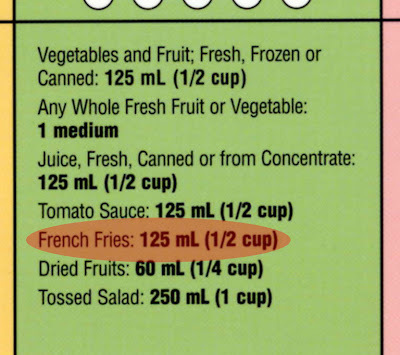 I can't imagine how the dietitians from the Dairy Farmers of Canada responsible for this handout go to bed at night.